The Trump Administration continues to plant more seeds for the coming era of transformation that we have written about in recent newsletters, Preparing for the Coming Age of Transformation and Ensuring Justice in the Coming Age of Transformation. It continues to put policies in place that go against national consensus on critical issues and is conducting a foreign policy that isolates the United States from the rest of the world. With each of these actions, the spring that will create the boomerang of transformation gets compressed further. This week, we focus on three areas: allowing federal prosecution of marijuana offenses where states have made marijuana legal, allowing off shore oil exploration throughout US coastal areas, and escalating regime change efforts in Iran. Each of these actions creates the potential for a larger boomerang in favor of economic, racial and environmental justice and peace if we organize around them. Is Going Backward on Marijuana Leading to a Sprint Forward? The United States was beginning to put in place laws and policies for marijuana in the post-prohibition era. The unraveling of the war on marijuana began in 1996 with passage of Proposition 215 in California, which allows medical use of marijuana. Since then, states have been putting in place both medical marijuana laws and legal systems for adult use. Attorney General Jeff Sessions’ reversal of federal marijuana enforcement policy and giving federal prosecutors a green light to prosecute people in states where marijuana is legal will slow or stop these developments and, at their worst, will fuel the wasteful and destructive war on marijuana. Twenty-nine states, the District of Columbia, and the U.S. territories of Guam and Puerto Rico have enacted laws that allow the medical use of marijuana. Marijuana is legal and regulated for adults in eight states, and adult possession and limited home cultivation are legal in the District of Columbia. Sessions’ action comes just three days after California implemented legal marijuana, while Maryland was implementing its medical marijuana law, when Ohio approved 12 large marijuana cultivation sites and Massachusetts is putting in place their legal marijuana system. On the same day as Sessions’ reversal, the Vermont House voted to make marijuana legal for adults. The bill is likely to pass the senate and be signed by the governor. Sessions’ action is out-of-step with the US public where 64 percent now support legal marijuana, including a majority of Republicans. On medical marijuana, over 80 percent support legalizing it for medical use. This national consensus on marijuana law reform is likely to grow in response to Sessions’ actions. The Cole Memo, issued by the Department of Justice during the Obama presidency, allowed these state laws to take effect. The federal government not prosecuting in legal states resulted in the development of a thriving marijuana industry that includes farmers and retailers, creating thousands of jobs. This $7 billion a year industry was expected to grow significantly with California’s law taking effect in 2018, along with other states; e.g., Massachusetts, Maryland, Ohio. The marijuana sector of the economy will grow to more than $20 billion in coming years if the federal government does not block the will of voters. The reaction will be swift as this decision is bad politics and bad economics. The backlash began immediately in Congress. Likely 2020 Democratic presidential contenders rushed to beat one another in criticizing the Trump administration’s backward action on marijuana. Not a single legislator put out a statement in support of Sessions’ steps on marijuana law reform. He is already isolated on the issue. He points to Republican Rod Blum of Iowa, a state that has not reformed its laws, co-sponsoring a federal reform bill. It will be up to the marijuana reform movement to educate and organize the public so that support for backward steps on marijuana becomes career-ending political poison. The movement needs to create an environment where legislators and those who run for office will be on the side of developing a sensible marijuana policy in the post-prohibition era. The immediate impact of Sessions’ rescinding of the Cole Memo was to create confusion, as now it is up to each US Attorney to develop a policy on enforcing federal law in states where marijuana is legal. This may lead to prosecution of some high profile marijuana businesses to send a message to others in the industry that they are at risk. The announcement has already had a negative impact on investment in the marijuana industry and made banks more reluctant to work with these businesses. Given the evidence that legal marijuana has solved problems, rather than created them, has been good for the economy and state budgets and is highly popular with super majorities of voters, the movement for sensible legal marijuana policies is well-positioned for positive changes in law in response to Sessions’ attempt to go backward to an all-out war on marijuana. Oceans are already at great risk and have been degraded. This new proposal threatens the oceans surrounding the United States further. Offshore oil drilling is risky, as experienced in the BP Gulf Oil disaster and the Exxon Valdez disaster, and is very expensive. It makes no sense to pursue these extreme extraction approaches, not only because of the risk to US coastal areas, fishing, marine breeding and more, but also because science tells us that we should not be investing in carbon infrastructure due to climate change. This announcement follows an executive order by Trump and new rules from his administration repealing rules that were developed by a national commission after the BP oil leak. The 2010 Deepwater Horizon disaster was the worst oil accident in U.S. history – eleven workers died, the oil rig sunk, and more than 4 million barrels of oil were released into the Gulf of Mexico. After months of investigation, the commission concluded systemic regulatory failures were the cause of the accident and developed rules to prevent similar disasters in the future. The Trump administration refuses to learn from those mistakes; and therefore, we are likely doomed to repeat them. The Trump administration builds on this mistake by opening virtually all US ocean waters to off-shore drilling. The Interior Department will hold 47 lease sales in every region of the outer continental shelf but one between 2019 and 2024. This includes the Pacific Ocean, eastern Gulf of Mexico as well as more than 100 million acres in the Arctic and along much of the Eastern Seaboard. People have until August 17 to express their opinion to Interior officials. While the oil and gas industry cheered, analysts and even some industry representatives cautioned that the plan’s signal may not immediately boost offshore development. Off-shore oil, which will involve billions of dollars in infrastructure, is likely to face multiple lawsuits from states and widespread public opposition. Shareholders, who have been pushing for oil and gas companies to disclose the damage they are doing to the climate, will also be a hurdle to exploration. This exploration could take 15 to 20 years to perform during a period when the impacts of climate change are increasing and investors will be concerned with the potential for stranded investments in expensive infrastructure and liability. Opponents include the governors of New Jersey, Delaware, Maryland, Virginia, North Carolina, South Carolina, California, Oregon and Washington; more than 150 coastal municipalities; and an alliance of more than 41,000 businesses and 500,000 fishing families. Opening up coastal drilling is deeply and universally unpopular in coastal areas, as previous accidents have devastated fisheries and tourism and left hundreds of miles of coastlines drenched in crude oil. Coastal communities are already dealing with increased storms, rising waters, comprised water quality and degraded fisheries. Once again, the Trump administration is going against the views of super majorities of people in the United States who oppose off-shore drilling by 59 percent, with 65 percent supporting “keeping as much of our current supplies of oil, gas, and coal in the ground as possible to avoid making climate change worse” and 60 percent prefer investing in energy efficiency and renewable energy sources over “traditional” energy sources. The movement for climate justice, environmental protection and putting protection of the planet ahead of profits will see their support grow as this proposal moves forward. The United States undermined its leadership in the world with its response to recent protests in Iran. While the protests were greatly exaggerated in the corporate media, they involved relatively small numbers of people and have been dwarfed by days of pro-government protests. The United States made a foreign policy blunder in bringing the protests to the UN Security Council this week. The administration hoped to undermine Iran’s government and the renewal of the nuclear agreement, but their action had the reverse effect. Other countries reprimanded the United States for misusing its status as a permanent member of the Security Council by bringing these internal issues that had no impact on international peace and security to the Council. Members said that for the US’ action to be consistent, the Security Council should have also considered mass protests in the United States, such as have occurred after police killings and with the Occupy encampments. Members of the Council saw the action as an attempt by the US to justify more sanctions on Iran and urged all parties, including the United States, to live up to the nuclear agreement, which is an important tool for world peace and stability of the Middle East. This support for the nuclear agreement shows that if President Trump takes actions in the coming weeks to continue US sanctions or undermine the agreement, the US will be isolated in the world and US leadership will be weakened. The opposition to the actions by the United States in the Security Council was not only from countries like China, Russia and Iran, but also came from US allies, including the United Kingdom and France. 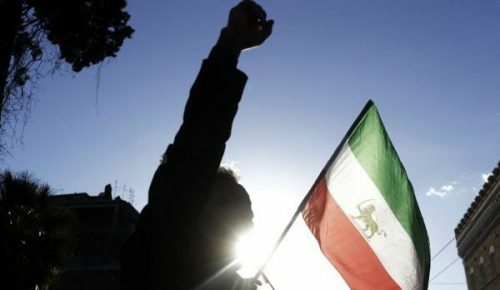 The US’ calls for regime change in Iran during the protests also resulted in Iran and other countries claiming that foreign governments were involved in creating and manipulating the protests for their regime change goals. Popular Resistance did a special report on Iran that included a review of US efforts at regime change that have been ongoing since the 1979 revolution in Iran. The United States has spent tens of millions of dollars annually to build opposition to the Iranian government through the Office of Iranian Affairs, the National Endowment for Democracy, Freedom House, the Democracy Fund and the US Agency for International Development. These are three examples from the last week of the United States continuing to work against the interests of people and protection of the planet. They are actions that are out-of-step with the views of people in the United States, views held by super-majorities of USians. The foreign policy actions continue what has become a consistent decline in the influence of the United States on the world stage. The US is becoming increasingly isolated because of its military actions, efforts at regime change, use of economic power to bully other countries and withdrawal from agreements like the climate agreement. The US is losing power, a symptom of the coming end of US empire. We urge people who seek economic, racial and environmental justice and peace to organize around these issues in order to make the boomerang against the years of big business-dominated government a strong one that ensures that many of the progressive, transformational policies we have all been working on for years become the reality. This article was posted on Sunday, January 7th, 2018 at 8:14pm and is filed under Donald Trump, Iran, Marijuana, United States, US Hypocrisy, War Industry.